Enigmatic businessman, linked with oil companies and foreign governments, whose exploits offer a glimpse into the struggle for the control of oil. The story of Francis William Rickett is riddled with contradictions. Bluff and resourceful, notorious for his exploits in the world of oil in the 1930s, he remains an enigma today. 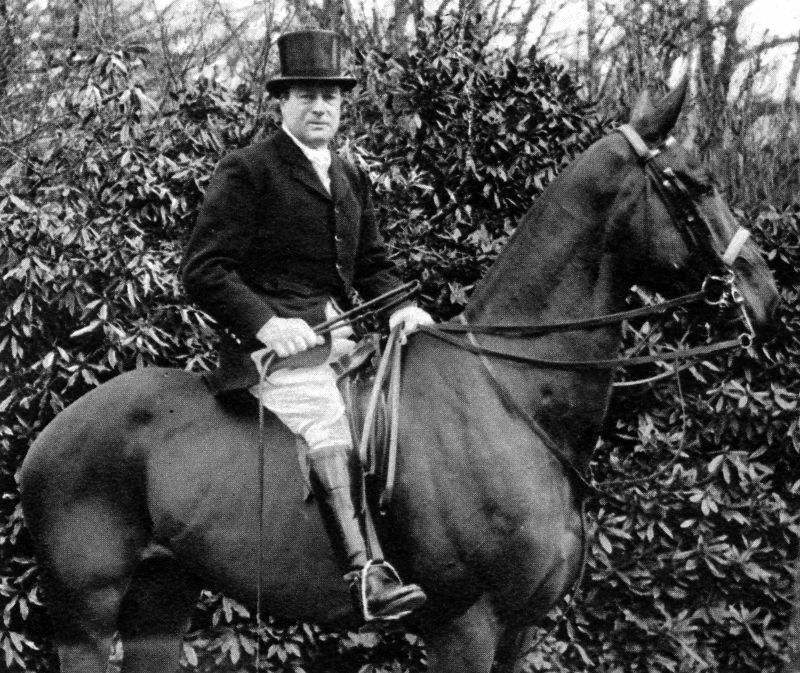 Francis W. Rickett pictured as Master of the Craven Hunt in September 1935. (Source: Illustrated London News/Mary Evans) Speculator and businessman he was, but he also had deeper links with oil companies and foreign governments than appeared in the press reports of the time. Above all, he lived in interesting times, and through his exploits we have a tantalizing glimpse into behind-the-scenes struggles for the control of oil. There was a time when the petroleum landscape seemed incomplete without the secretive figure of Rickett passing through. His background was in the oil business, being primarily interested in concessions, and any other business he could lay his hands on. In the early 1920s he represented the heirs of the deposed Ottoman sultan, Abdul Hammid, who claimed the oil and mineral rights of Mesopotamia (as Iraq was once known). He also dabbled in Russian and Romanian oil holdings, and in everything ranging from the supply of uniforms for the Greek army to a loan for the city of Lille. In 1922, when the Lausanne Conference of international powers was discussing the future of the Mosul viyalet (district), Ricketts brought a high-powered Turkish delegation to London, claiming he had influence with important people including the British prime minster. He proposed that Great Britain should withdraw from Mosul in return for substantial oil concessions from the Turks, but was firmly nobbled by the foreign secretary, Lord Curzon, who also warned off other potential backers of the scheme. One of those backers was the shipping magnate, Lord Inverforth, who was associated with Rickett in several business ventures. The most ambitious was a German-Italian-British project, British Oil Development Limited (BOD), which in 1932 obtained an oil concession covering 120,000 km2 west of the River Tigris in Iraq. Three years later, after the Italians had taken a controlling interest, it was reported that Rickett was no longer involved in the company although he retained a major shareholding. The prospect of an Italian takeover alarmed the Foreign Office, and there was great relief in London when the British-led Iraq Petroleum (IPC) group eventually took over the concession. It was rumored that Rickett was attempting to obtain an oil concession for Basra, but this also went to the IPC group. Haile Selassie in his palace at Addis Ababa in 1942. (Source: Library of Congress) In August 1935, Italian dictator Benito Mussolini was making threatening noises towards Ethiopia. 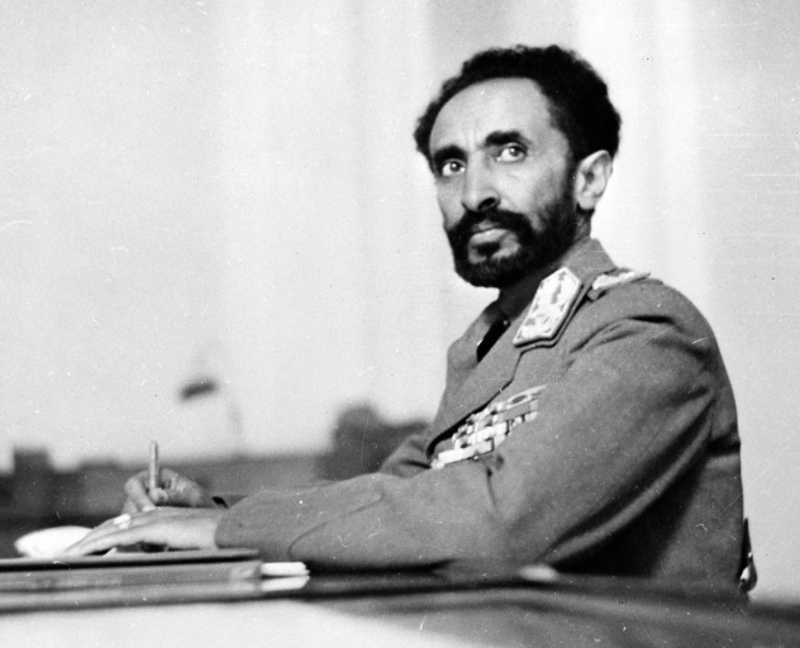 The emperor of that country, Haile Selassie, was anxious to involve Britain and the United States in his defense, hoping that if one of their oil companies was operating a concession there, they might intervene in the event of an Italian invasion. The idea was not entirely fanciful – the Standard Oil companies of New York and Jersey were interested in Ethiopia, the latter having sent a survey party there in 1921. In July 1935 they formed a subsidiary, the African Exploration & Development Company, to pursue a concession, and the 46-year-old Rickett was dispatched to conduct secret negotiations with Haile Selassie on the company’s behalf. In August 1935, Rickett was not widely known. The English writer, Evelyn Waugh, was commissioned by the Daily Mail to cover events in Ethiopia and met him as just another passenger on the long journey down from Port Said. Rickett hinted that he was on a mission for the Coptic Church of Egypt, but spoke more openly about his pack of hounds, explaining that the coded cables he kept receiving were in fact messages from his huntsman in England. Although Waugh was suspicious, he had no inkling that Rickett was about to snap up the most astonishing oil concession of the time. In fact, none of his fellow travelers could really fathom what Rickett was up to and when they arrived at Addis Ababa, Waugh sent a letter to his head office in London asking for more information about his mysterious traveling companion – too little, too late. Waugh was soon sidetracked by another story, leaving the capital a few days later in order to investigate the case of a Frenchman and his wife who had been imprisoned for spying. While Waugh was up country, Rickett was conferring with government officials in Addis Ababa at the dead of night. After a week of to-ing and fro-ing, papers were signed by which about half the nation’s subsoil rights – an area of nearly 400,000 km2– was made over to Rickett for a period of 75 years. He caught the morning train for Djibouti, breaking news of the agreement to two journalists before his departure. By the time he sailed into Suez, the story had made world headlines. Waugh, for his part, missed the scoop and was sacked. 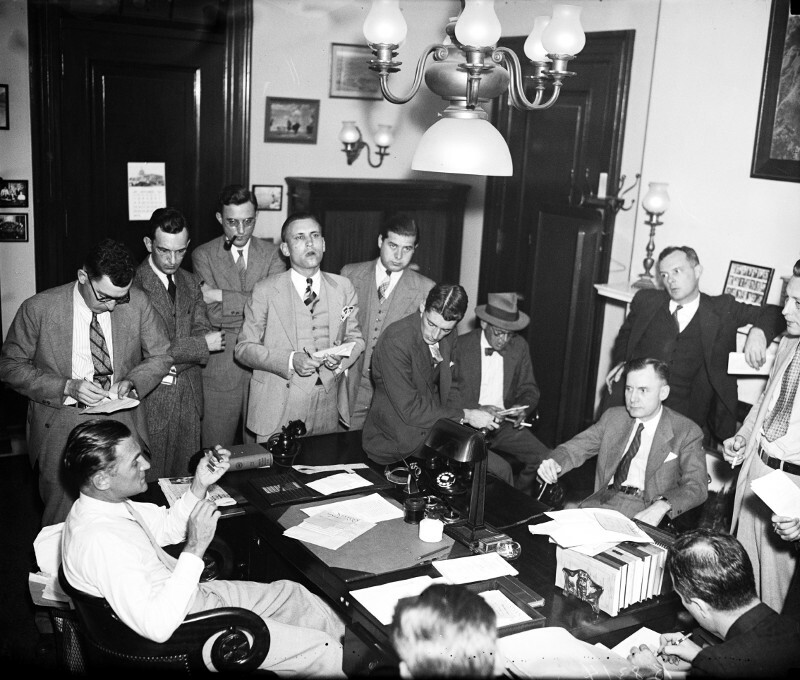 US senators at a press conference to discuss Rickett’s Ethiopian concession on September 3, 1938. 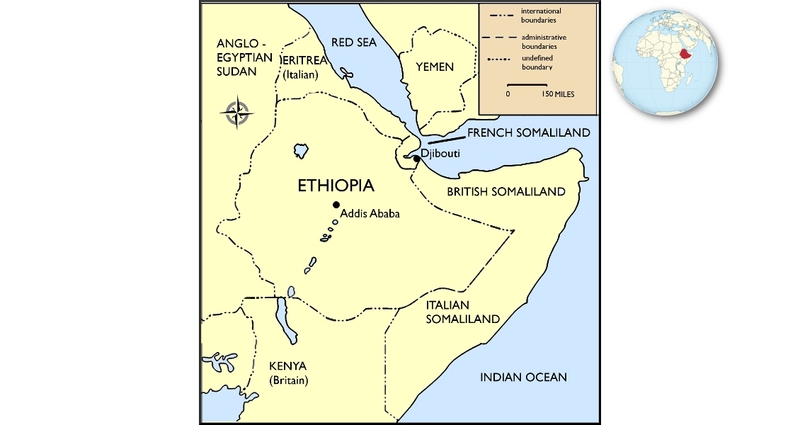 (Source: Library of Congress) Back in London, the British government was exposed to accusations that it was trying to exploit Ethiopia’s natural resources at a time when Italy was about to invade the country. In Washington, too, there was consternation, and Standard executives at first denied any knowledge of Rickett’s dealings. In the event, there was no British money involved and secretary of state Cordell Hull intervened to scotch American involvement in the deal. Five months later, as Italian troops were advancing on Addis Ababa, Rickett still had the concession document in his safe and was trying to peddle it to Mussolini for $5 million. His efforts came to nothing, but anything Rickett did at that time was bound to attract the attention of a salivating press. He was dubbed the ‘Lawrence of Oil’ on account of his Middle Eastern connections. He also happened to be a wealthy man, owning a mansion in Berkshire and a castle in Pembrokeshire, with King Feisal I of Iraq as one of his house guests. Rickett was certainly well connected around the world and, with his friend and traveling companion, Ben Smith, they made a fine pair of predatory speculators. Smith, who had acquired the monicker ‘Sell ’Em Ben’ from his days as a trader on Wall Street, was a notorious short seller. Described as an aggressive Irish-American, he was remembered as the trader who ran through a brokerage house in the crash of 1929 yelling “Sell ’em all, they’re not worth anything”. More recently, he had turned his mind to gold, having made a fortune in the Alaskan gold fields. He was on good terms with the Maharaja of Jodhpur. When invited to stay at his palace for a few days, Smith and Rickett hopped on a plane and flew themselves from London to India. The plane, a Vultee 1-AD which belonged to Smith, was previously registered to the Cord Corporation owned by the famous American motor manufacturer, Errett Lobban (E.L.) Cord. Smith had used the plane during the Ethiopian venture to carry out aerial surveys on behalf of Standard Oil. In those days, it was no mean feat for individuals to fly between England and India. Among other things, the Persian Gulf was closed to private aviators – not that such a minor detail would put off Messrs Rickett and Smith, of course, and they flew on regardless, taking advantage of a tail wind to assist them across Iran to reach their destination. On the way back, however, their luck ran out and they were forced to land at Sharjah on the Trucial Coast (today’s UAE) where the British authorities kept a close eye on new arrivals. The unabashed Smith alighted from the plane and asked the British agent if he knew the whereabouts of any gold mines in the vicinity. But it was Rickett, with his oil connections, who set the alarm bells ringing. Within days of their leaving, he had been banned from traveling to the Gulf ever again. There was no doubt that the Ethiopian episode followed in his shadow. Although Western oilmen and politicians alike were wary of him, he did represent the spirit of free enterprise, and possessed a readiness to cut through official tape. Many tried to place obstacles in his way, but that did not prevent him from embarking on his next adventure with Smith – a foray into the Mexican oil business. In 1938, Rickett was in his element. Following a period of labor unrest, Mexico’s President Lázaro Cárdenas had confiscated all foreign-owned oil properties. Standard New Jersey and Royal Dutch Shell were the two biggest losers and imposed an oil embargo against Mexico, with the result that Cárdenas was urgently looking for buyers of his country’s oil. Enter Messrs Rickett and Smith who, with the backing of Lord Inverforth, flew down to Mexico City in order to negotiate a deal with the Mexican government. It was rumored that they were aiming to buy 25 million barrels of Mexican oil below the world price. For the Mexicans, the advantages of such a deal were plain: it would bring in some ready cash to keep operations going and enable them to make the first compensation payments to the deprived oil companies. Rickett repeated the tactics he had used in Ethiopia, declaring that his real purpose was to prevent fascist dictators buying up cheap oil – he was saving the oil for the Western democracies. “My motives,” he announced, “are patriotic!” Washington, however, thought otherwise. President Roosevelt, while recognizing a country’s sovereign rights over its natural resources, demanded compensation based on the price originally paid for the properties and their development, less depreciation. Whitehall was not impressed either, and the City of London wrote letters in the British press denouncing Rickett’s proposal. When Rickett tried to ship his first load of Mexican oil to England, he found that his bank account had been frozen. Although Rickett was primarily a businessman, his treatment at the hands of the British and American governments may have colored his approach to politics. In late 1939, together with a group of American pro-Nazi businessmen, he was implicated in a plan to bring World War II to an early end. This was the time of the ‘Phoney War’ and General Wilhelm Keitel, the head of the German High Command, was sending out feelers for a peace treaty. The Foreign Office gave the plan no credence, and the British ambassador to Washington remarked that Rickett and Smith were “catspaws of the Nazi government”. It seems that Rickett served out his war service as an ordinary seaman based on a naval patrol boat in the English Channel. 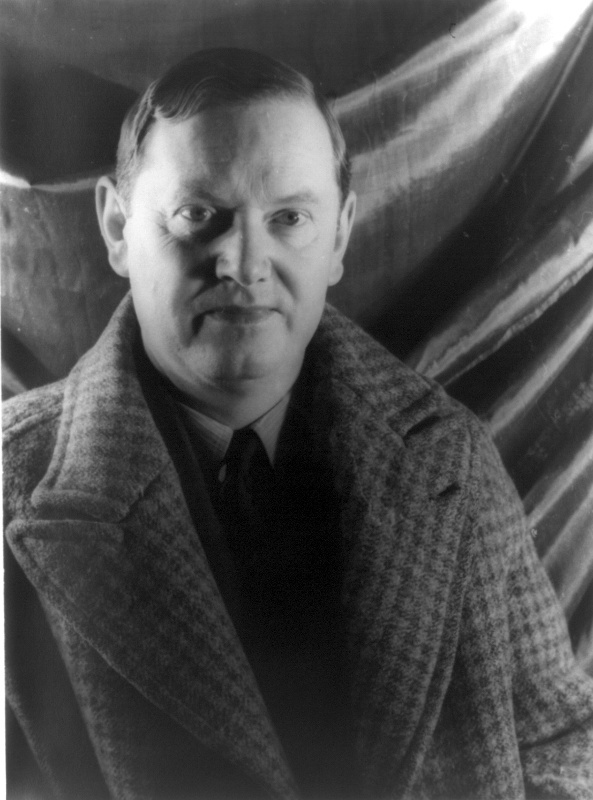 Novelist Evelyn Waugh, who met Rickett on his secret mission to Addis Ababa. (Source: Library of Congress) In 1947, press reports from Cairo suggested that Rickett was in Turkey on a secret oil mission. “It’s oil he’s after again!” they proclaimed. But by 1950 he had fallen on hard times, having sold his Berkshire mansion and been made bankrupt. In November of that year, a French court sentenced him to eleven months’ imprisonment in his absence for breaking currency laws. Ten days later, as police were still searching for his luxury yacht crewed by ex-Luftwaffe and U-boat men, Rickett turned up at Baghdad’s best hotel. Like a pantomime villain, he appeared sleek and grey haired, dressed in a flowered dressing gown and holding a foot-long cigarette holder. He dismissed the prison sentence with a wave of his hand: “My lawyers are paid to deal with such annoyances,” he said. We do not know if Rickett ever served his sentence, and perhaps it is better kept that way. Certainly for Evelyn Waugh, who fictionalized him as the character Baldwin in his novel Scoop*, the secretive businessman would always be remembered as ‘the one who got away’. * Scoop by Evelyn Waugh, Penguin, 2012, (first published by Chapman & Hall, 1938) is available from all good book sellers. The author thanks Peter Morton for his kind assistance. It took nearly a year for the cable-tool rig to reach a total depth of 427m. The Lineham No. 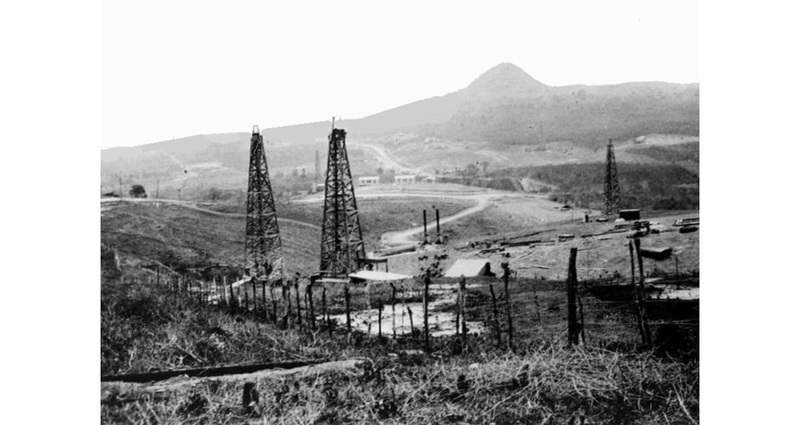 1 well had oil shows throughout the drilling process, and oil began flowing on September 21, 1902, from a depth of 310m. The first offshore well was drilled in shallow water in 1968. For the next 30 years, Petrobras has been challenging ocean depths with the innovation and technology that has brought the oil and gas industry into the ultra-deepwater era.